The following picture and poem have kindly been sent by Ken Webb. Ken's Great Grandmother, Lydia Evelyn (Eva) GOLTZ (nee Grey) resided at Crystal Hill Tarnagulla with her husband Arthur Goltz. When going through a number of old letters has came across a hand written poem of 5 verses. He'd like to believe were written by Lydia but we don't know. Maybe someone will recognise this poem. It is a very moving ode to the mood in the town at the time. Whats become of all the boys? Sharing each the other's joys. Have sterner work to do. Where are those once busy footsteps? Angels guard them where they lay. 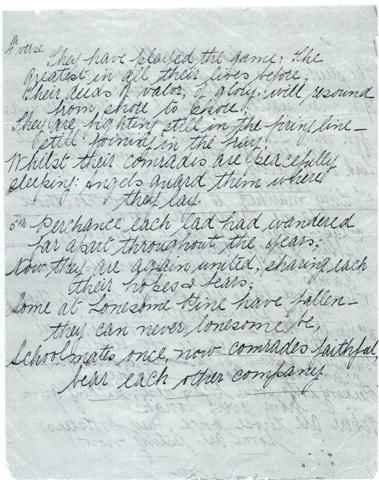 An image of one of the hand written pages with the poem on it. A photo of two of Lydia's brothers, Horace and Devon. 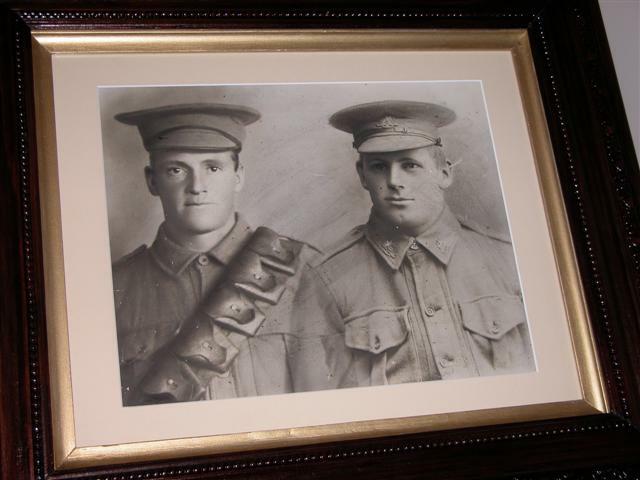 Horace Leslie Grey (on the left) was killed at Gallipoli 1st August 1915 aged 24 years and buried at Lone Pine. His brother, Devonshire Dickson Grey (on the right) received the Military Medal, for his stretcher bearer duties during operations around Glencorse Wood, east of Ypres on the 20th and 21st Sept 1917.